The season is upon us. Hooray, hooray. 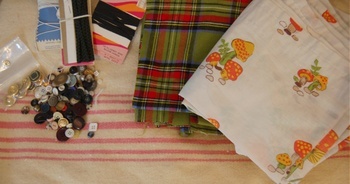 And hooray for a morning spent rummaging and thrifting with a dear friend. Some finds from the day: (sorry, I'm forging ahead with bad lighting because I'm too impatient to wait for the sun). Book finds. 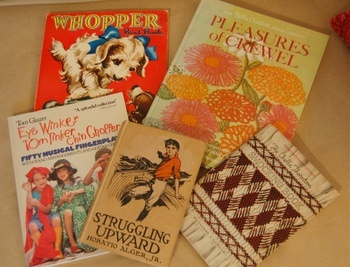 Vintage new coloring book, 1972 The Pleasures of Crewel, child's finger play book, a 1950's Smocking book (! love ! ), and a vintage children's book that I couldn't resist for the cover. Check that dude out! Tins. These are all so bright and colorful and in perfect condition. Had to scoop them up and take them home with me. Especially at 10cents a tin. A favorite find. 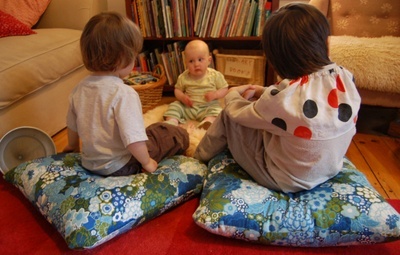 These fab pillows, which are just perfect for snuggling and reading, or sitting and listening to the Wizard of Oz soundtrack, or even for a family staring contest (apparently that's what they were having during this photo). And yes, this was THE find. mav and I both gravitated towards this instantly at a yard sale, when a sweet older woman came up to tell us that her grandchildren all used it (it's in impeccable condition! ), and she'd sell it to us for $10. Who could possibly say no to that? 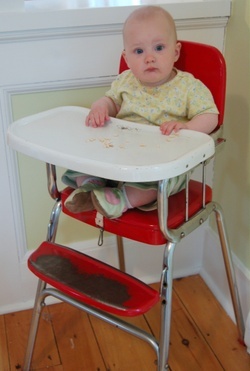 So..Adelaide has a new high chair, after which I'm going to be sure to pass this beauty on for another little one to enjoy. Oh, and that green wall behind her? That's what the rest of our weekend was spent doing--painting. More on that drama, and the results later this week. Oh, and some answers to your questions, a long promised tutorial and other surprises coming up this week, too. Oh, Monday's are always so full of grand plans, aren't they?